One of the many challenges facing writers in our new age of broken barriers and floods of books, is how far we all go with our self-promotion. Some of us decide this new age of social promotion is not for us, while others embrace it. But to embrace online promotion without a strategy we can believe in, which respects our goals as writers, as well as our readers, places us on shaky ground. Are writers destined to be hucksters selling our wares at the side of the internet superhighway? Or do we have a mission for all this Tweeting and posting which isn’t just about royalties and me, me, me? 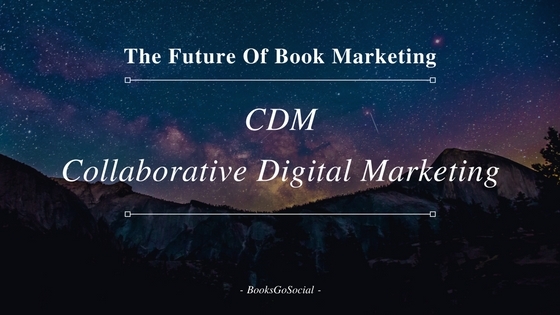 One possible route for writers struggling with all this is to adopt CDM – Collaborative Digital Marketing, as the way forward. The C, the collaborative part, is what makes this different from the usual look-at-me digital marketing which drives a lot of the promotions authors have done so far. Other authors are collaborating in multiple ways including, as one prime example, on Instafreebie where we promote each other’s eBook giveaways to help fellow authors and ourselves, to build up those all-important email list. Authors are also working in teams to support each other in a wide variety of ways, including publishing anthologies. One such anthology recently reached the Wall Street Journal bestsellers list. A team of authors from BooksGoSocial achieved that just before Christmas, 2017 with The Twelve Slays of Christmas. There are also hundreds of Facebook groups and groups of Twitter #tag users springing up, catering for hundreds of thousands of authors. And that’s just the tip of the Collaborative Digital Marketing movement. Authors of all genres are avidly embracing the opportunities that our newly connected social world provides. A decade ago it would be unthinkable that we could connect with multiple groups of authors before breakfast and help authors in those groups to sell their books by sharing them with our own followers. It is now possible to share book links and short descriptions in a few seconds to followers on Twitter and Facebook and LinkedIn and Instagram and all those other services we have taken on board in the past few years. The key principle of Collaborative Digital Marketing is a system of collaboration that goes back to the first days of bazaars and markets almost everywhere. Simply put, by joining together we can more easily attract readers. Think of farmers markets and trade shows, but mostly online. Collaborative Digital Marketing provides a sense of purpose about what we are doing on social media as authors. The instinct to help others is as old as humanity. It provides pleasure to the giver and support to the receiver. We are hard-wired as a species to help other members of our tribe. The age of the navel-gazing, self-obsessed author in his ivory tower is drawing to a close. A cultural change is occurring around us. Minorities and the underrepresented are joining in. The personal and technological forces, and the opportunities they provide, are too strong a lure to stop it happening. If we look at the latest eBook growth figures, and include the indie publishing figures often left out in the main stream media, we see a continuing rise in the sales of eBooks from authors outside the mainstream. One piece of data from the January ’18 Author Earnings Report struck me as a reflection of the growth of authors outside the mainstream traditional publishing world: 284 of the top 1,000 selling eBook authors in the US in 2017 were titles from self-published indies. The steady growth of indie publishing is, without doubt, supported by author collaboration. The norms of the indie community include sharing writing craft and marketing techniques with each other, as well as helping each other with promotions. And for those among us who need to understand “what’s in it for me,” consider the Law of Reciprocity, which applies across most cultures, and ensures that those who we do help feel a compulsion to return that help. Sure, not everyone will respond to the messages in their head to give back, but a high enough percentage will, resulting in us receiving real value from helping others. A further benefit of CDM for many will be the relief from the sense of isolation, which “me-me-me focused” social media and online promotion activities engender. Isolation is a by product of the age we live in, where we rush from pillar to post in increasingly busy lives, as we strive to pay our bills and do everything expected of us. Spending our time on social media promoting our own books adds to our burden. But helping other authors alleviates our isolation with messages of thanks and the possibility of real human connections. And for anyone who sniffs at the suggestion that real relationships can be formed from online ones, I suggest you join us at the Dublin Writers Conference, an annual event born out of social media. The challenge for author collaborators, as they embrace all this, is to ensure their work is of a high quality and well presented online. Increasingly they will have to. Market forces determined by reader preferences for quality in presentation and editing will force authors to adopt a ‘quality first’ model or drop out of the race. The authors who have addressed these issues will get shared more, and sell more, compounding their success. The question is, how does this all work in practice? 1. On Facebook and Twitter and whatever other social platforms you are on, share the posts of authors whose books you enjoy. 2. Provide guest post opportunities for authors on your blog if you have one. This kills a few birds at the same time; the need to create new content, and the need to connect with other authors by helping them. 3. Join a free author team in your genre. One example is where BooksGoSocial will match you with other authors in your genre also interested in collaborating. We have over 1,000 authors from around the world collaborating and helping each other, for free. Sign up here. 4. By creating or using our email lists to send out information on the books we like and the authors we want to support. Not every author can do these things, but for those who can, even in a small way, this will provide a fulfilling purpose to our engagements online, to ensure that we sell our books, not our souls, by placing helping other authors at the core of our online activities. The real first step however is to consider our attitudes: Do we see collaboration as a good thing? And are we willing to take action if we do? The authors you help are not determined by anyone but you. You can find some by searching for the #BGSAuthors hashtag or simply by joining a local writing group or attending a writer’s event in your area, or further afield. Whatever you do, remember, by collaborating you are part of a movement to make these new technology tools work for our purposes, so that we all gain, and new voices can be heard, previously unheard stories, not the same old ones, can find readers too. Please comment with your opinion or share this post and your thoughts with others using the #BGSauthors tag. This is a discussion that needs your input, your collaboration. Laurence O’Bryan has been training authors in digital marketing since 2012 and is also a published author. Three of his mystery novels were published by HarperCollins and translated into ten languages. He also self-published Social Media is Dynamite For Writers, and two other novels in the puzzle series. He started BooksGoSocial.com to help other authors get discovered. The service has helped promote over 7,500 international authors. He also founded the Dublin Writers Conference. He will be speaking on the subject of CDM at the London Book Fair in April and at the Dublin Writers Conference in June, 2018. Thank you Laurence. I welcome these ideas to help expand reach on an individual and author team level. It’s my pleasure to put this into practice for my upcoming thriller #Davanti with the BooksGoSocial.com team. We’re looking ahead to a 2018 spring release and campaign with BooksGoSocial.com. It’s been great fun with our Davanti contest launch from Rome with our U2 friends U2360gradi (in Italian, French with Marcel of Dandy Cannes, Irish and English; 8 major cities in 5 countries)…plus jewelry and promotion with Jane and Rock Your Messages! We just announced the winners on Twitter. I really like this idea of helping other authors. It’s actually more stimulating to be helping somebody else instead of constantly self-promoting. I’ve never been one to toot my own horn. I have nothing against people that do. Some people are born salesmen and just instinctively seem to know how to sell, sell, sell, themselves. That’s just not me, though. I like the ivory tower but I also like to help others a lot. So this looks like a great fit. Thanks so much for this post and good luck with the Davanti series!!! How wonderful! Yes, I agree that it is so beneficial that these ideas work in a variety of ways and for many personalities. I am putting some of these into practice as well. Thank you Anthony and best wishes for your writing! Thank you all for your support. Our mission in these dangerous times is to reach out and help each other in whatever way we can. Do something small today to show we can go further. Little things make a big difference. Thank you Akasha for all you do for us. Laurence O’Bryan. Exactly. Thank you Laurence for your inspiration, ideas & light. ✨ My pleasure to help share this! Cheers.